About a month ago, it came to that spot in the summer when the peaches and blueberries are ripe at the same time. I love that time. First, my parents, my sister, my nephews and I went blueberry picking. One of my nephews loves blueberries – I mean he LOVES blueberries. When we were picking he said, “Auntie is it still afternoon?” “Yeah,” I said, “it’s still afternoon.” “Oh good!” he said, “That means we still have more time to keep picking!” He really is a good little worker in the blueberry patch too. He knows he’ll be enjoying those blueberries for breakfast all winter long. My mom and I went a second time and picked more because I love to have them in the freezer too, ready for baking into recipes. Then, my other sister called to say her farm market had peaches ready. We always buy our peaches from her farm market because they have the best deal. 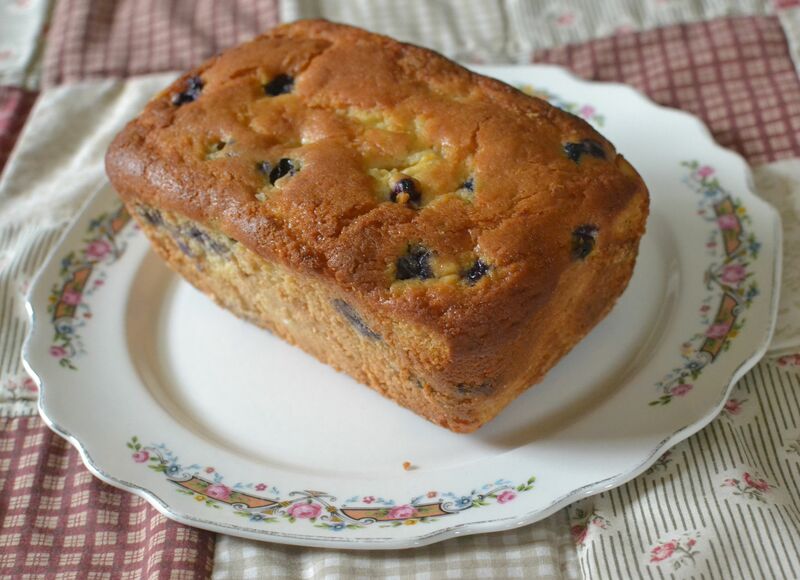 So, we had a bushel of peaches and lots of blueberries and I decided I needed a recipe that would use both. I looked through my grandma’s recipe boxes, but I couldn’t find anything with peaches and blueberries. So, I looked elsewhere, found this recipe, and changed it up a little to make it the way I wanted it. In the bowl of a stand mixer, cream together the butter and sugar. Add in the eggs, one at a time, mixing after each egg is added. Add in the vanilla. Mix well. Add in the yogurt and mix until well combined. Gently fold in the blueberries and peaches. Bake for 1 hour and 15 minutes, or until the top is lightly browned. It turned out to be a great recipe. The combination of the two fruits complimented both the appearance and the taste. I made a couple of loaves and was able to take one to my parents’ anniversary luncheon at Wendy’s house (the luncheon she talked about when she shared Mrs. Magary’s spice cake). It was a pretty bread for a special occasion. I hope you can give this recipe a try. If you do, let me know what you think. Frozen blueberries should work just fine and I would think canned or frozen peaches would be okay too. 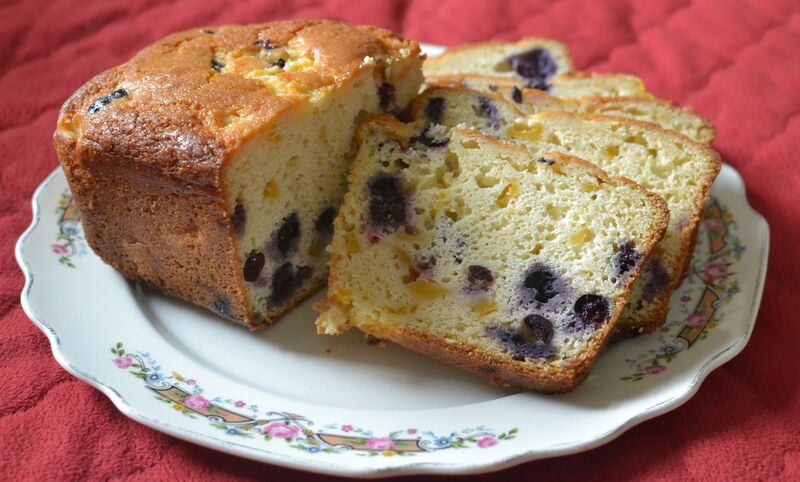 This entry was posted in bonus recipe, Breads, Side Dishes and tagged baking, blueberries, Bread, fresh fruit, homemade, peaches, scratch cooking by GrandmothersRecipeBox. Bookmark the permalink. Thanks Rebekah! Let us know what you think after you bake it. I have a feeling you’ll love it as much as we did!